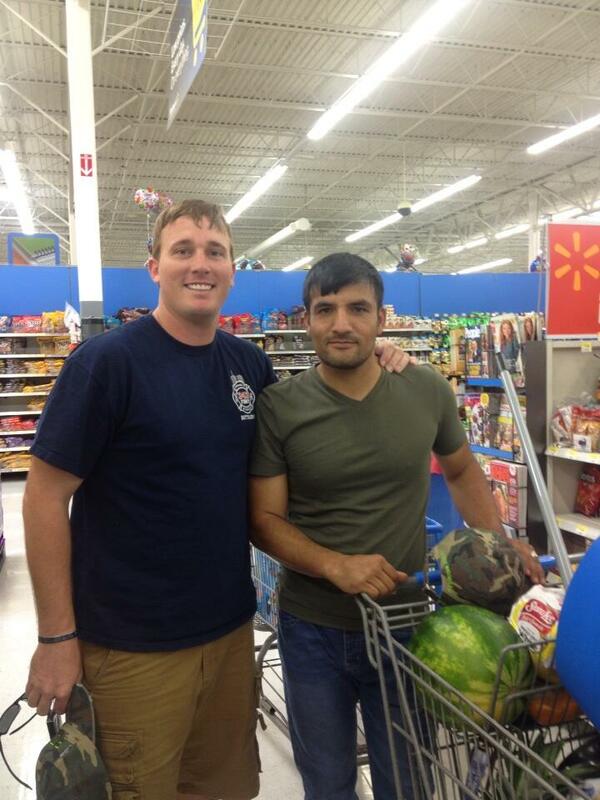 In recent weeks, Medal of Honor recipient Dakota Meyer has forcefully advocated for the U.S. to allow his former Afghan interpreter into the U.S., saying the man feared for his life after getting death threats from the Taliban. Fayez, shown at right with Meyer, is now in the U.S. The Marine posted the photograph on Twitter on Friday, adding a note that showed relief. Fazel — known in a lot of previous media coverage as Hafez to protect his identify — was in the Ganjgal Valley in eastern Afghanistan on Sept. 8, 2009, when forces from Meyer’s unit were caught in a fierce ambush staged near the Pakistan border. Meyer, now a sergeant in the Individual Ready Reserve, received the Medal of Honor in 2011 for heroics in the battle. A soldier also in the melee, Army Capt. Will Swenson, will receive the U.S.’s top award for combat valor in a White House ceremony Oct. 15. Meyer’s book, “Into the Fire: A Firsthand Account of the Most Extraordinary Battle of the Afghan War,” portrays Fazel as a hero. It says the linguist was with a four-man team of U.S. troops that went missing when the ambush erupted. They covered his initial escape from the village, but he sustained a minor gunshot wound to the right arm in the process. A second round hit him in the armor plate covering his back. Nevertheless, Fayez volunteered to go with Meyer back into the Ganjgal Valley to help wounded Afghan soldiers and find the missing U.S. troops: Marine 1st Lt. Michael Johnson, Gunnery Sgt. Edwin Johnson, Marine Staff Sgt. Aaron Kenefick, and Hospital Corpsman 3rd Class James Layton. All four men died that day. A fifth member of the training team, Army Sgt. 1st Class Kenneth W. Westbrook, died a month later from wounds suffered during the battle. Under fire, the interpreter hopped in and out of the Humvee driven by then-Staff Sgt. Juan Rodriguez-Chavez to assist Meyer, according to the book, and later manned the gun turret. Meyer and the co-author of his book, Bing West, take the U.S. to task for failing its interpreters in an opinion piece that was published in the Washington Post last weekend. I was born in the USA. I was trained in the USA at DLI (Defense Language Institute. )I speak multiple middle eastern languages and dialects. This can all be learned and acquired. I would love to say I would have the courage and instinct that Fazel had, but I cannot be certain that I would have. This is an amazing story and a true testament to the faith and brotherhood that is fostered within the units. Thank you Dakota for standing up and demanding that the foreign linguists be allowed the opportunity to enter and live in the country they have fought so hard for. These men ( and women) have given up their safety in their home country for a cause they believe in and that is so incredibly admirable. Fayez should be awarded the Silver Star for his action. He does not qualify for the Navy Cross, though that is certainly deserved.